It is unlikely that anyone will ever install an historic marker on the tiny remnant of George Street that survives in downtown Cincinnati. If such a marker ever materialized, however, it would have many tales to tell—but not in polite company. By the time this photograph was captured around 1920, the bordellos of George Street were allegedly shuttered by federal mandate. A few survived, very discreetly, into the 1930s. Today, George Street is just one block long, little more than an alley linking Elm to Plum between Sixth and Seventh streets. Cincinnati Bell occupies the entire north side, forming a canyon with the parking garage opposite. Even a century ago, this was the boring end of the street. Westward, as it crossed Plum on its way to Mound Street in the West End, George Street inspired rhapsodies as scribes and reformers attempted to describe the sinfulness of this supermarket of sin. In 1890, just four blocks of George Street contained 46 brothels, each supporting an average of five to seven prostitutes. The heart of Cincinnati’s so-called “red-light district,” George Street featured 46 brothels (marked as pink) in the four-block stretch from Plum to Mound. There were also eight saloons (marked in green), usually located at intersections. The response from Cincinnati Police Chief Philip Deitsch? He refused to shut down the “lupanars,” but offered to invite the madams to move their businesses a little eastward, to the blocks between John and Plum Streets. So incensed were the law-abiding residents that they attempted to rename the western section of George Street as Kinneon Street in 1887. City Council voted against the proposal. George Street was home to such colorful characters as Mollie Chambers, reputed to tip the scales at 300 pounds, whose brothels often erupted into fisticuffs among the inebriated patrons. Dora Green presided here, too, and the mystery of how she remained unarrested for so long was solved one day when the newspapers reported how she loaned money—lots of money—to police officers on the George Street beat. Edna Creighton’s “resort” made the papers when Harry Borgman, a traveling salesman, shot another patron named Herman Klein. Although Borgman’s gun was loaded with blank cartridges, the wadding infected Klein’s wound and blood poisoning proved fatal. George Street was the scene of a scandalous murder-suicide in 1883, when 19-year-old embezzler Bert Schieble killed his lover, a prostitute named Josie Stupp, in Belle Kirk’s house of ill fame at 141 George Street. 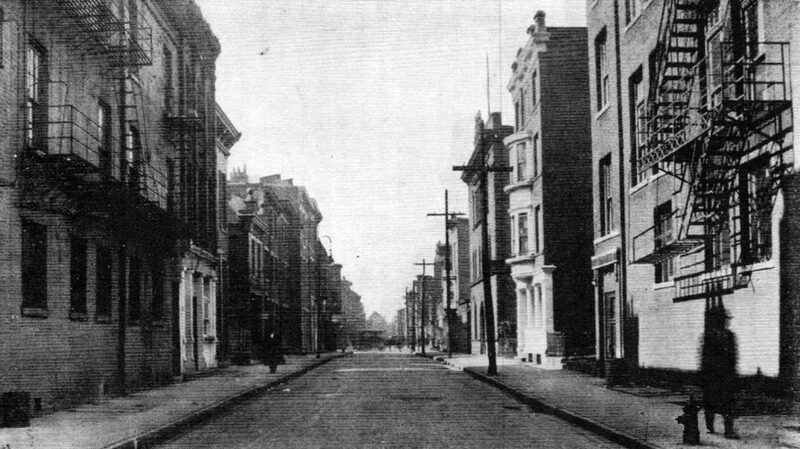 The death knell for George Street was sounded during World War I. To promote “maximum efficiency” of its fighting force in World War I, the U.S. Army instigated a federal law banning “objectionable” establishments within a five-mile radius of any military training facility. The proximity of Fort Thomas in Northern Kentucky led federal authorities to clamp down on Cincinnati’s so-called “segregated district” in the West End, especially infamous George Street. Today, the entire sin-drenched avenue, from Plum to Mound, has been demolished. The eastern section lies underneath the parking garage north of the Convention Center and the western section is buried by a tangled web of I-75 exit ramps.